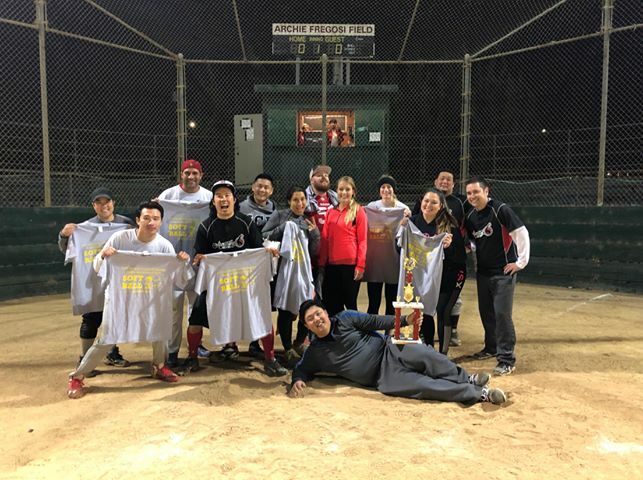 Genentech’s coed team came in 2nd place in the championship game on the Archie Fregosi field at Orange Memorial Park on Monday. It was a great battle between the Gene Fiends and their arch rivals Fog City. It was a hard-fought battle in which Fog City prevailed. Big thanks to Larry and Dennis, our two umpires for the night for doing a great job calling balls and strikes! Come out tonight to cheer for GENE MACHINE as the Men’s Championship game is played at 7:40pm at Orange Memorial Park! A win for the Gene Machine brings them back at 8:45 to play the winner from the 6:35 game!